If you are unsure about anything. That’s anything at all. STOP. Make an excuse if you have to, and call us. We’ll confirm if it is a scam, and if so…. what to do. There are so many scams around these days that it’s impossible to keep up with them all. But the good news is, there’s a lot you can do to avoid being caught out, and a lot you can do if you do become a victim. But first we’d like to make it clear that no matter how tech savvy you may be, you can still be caught out. The important thing to realise, is that you’re not alone and you shouldn’t feel foolish or not seek help because of embarrassment. The following advice is based on our own personal experiences, from working in the I.T. industry. While we feel it’s good advice, this problem is continually growing and evolving. So, we strongly recommend you also read advice published by Consumer Affairs as the authority on this subject. To Avoid Being Caught Out. If anyone calls you, and you don’t personally know them. Then don’t give them any information. That includes seemingly harmless details like your full name and address. If you think the call is legitimate, then call them back (but don’t use any phone number they give you). If it’s your bank or a company like Telstra, look up the number in the telephone directory. Never let anyone have remote access to your computer, unless this has been previously arranged with someone you know (such as your friendly Masterlink technician or a family member). Also, don’t do anything else they tell you, such as press numbers on your phone. Actions such as this can give them authorisation on your behalf. It’s also important to remember that a phone call can look like it’s originated in Brisbane, but the caller is actually located in Africa. And not all hoax callers have Indian accents. If you are suspicious of any call, then hang up. The world isn’t going to end if you do this. If you want to get advice, then tell the caller you must go, because you have an appointment and to call back later. A legitimate company will never call you, to say your “computer has a virus” etc. Simply by doing this they are admitting to breaching the privacy laws. When you receive an email, asking you to click on a link. Have a look at the email address it’s come from. This usually tells you if it’s a hoax. The same with websites. Have a look at the address, if the site is “secure” then it should have https at the beginning of the name. Some browsers also have a padlock symbol to show the site is safe to use. Keep your antivirus, internet security and malware scanning software up to date. Although Windows updates are a pain. It’s also a good idea to install these, as they include security fixes. There is a really good website run by the Australia government, called scamwatch.gov.au On this site you can easily find information on scams, which explain how they work and the risk you’ve been exposed to. They also ask that if you’ve come across a new scam, to report it to them. So, others don’t get caught out. We have heard of cases where people come to the door. It’s always harder to turn people away face-to-face, but doing so may save you a lot of grief later. Legitimate, professional I.T. companies don’t knock on doors. Only deal with businesses that have a shop front or advertised place of business. I.T. personnel should be qualified and insured, and when you do want to follow up on an issue. You need to be able to find them. Don’t write your passwords down. Don’t use the same passwords for everything and change them regularly. A good password should have capitals, lower case and numbers and at least 7 characters in length. If in doubt, ask someone you trust for advice or contact your local I.T. Service Provider. Such advice is always free from a professional service. Turn off your computer. Don’t use it again until you get advice. 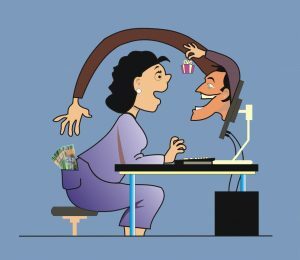 If you’re still on the phone talking to the scammer, then disconnect your computer from the internet, before they realise you’re onto them. If the scam involves your bank or financial information. Then contact your bank immediately and follow their advice. Change any passwords which may be compromised. Such as your telephone banking password, email etc. Have your computer checked. This check will look for malicious software, such as key loggers, remote access utilities etc. Scan for malware and viruses, ensure antivirus, windows updates, security patches etc. are current. And check for security breaches. Sometimes scams get the email addresses of your family and friends. You may need to contact them, so they are aware that emails supposedly coming from you, may be spam. Again your I.T. Support can advise you. When you get a chance, visit the website scamwatch.gov.au Which will give you specific information.